° Come home to your own resort! Beautiful hardwood floors, Stainless Steel appliances, tile backsplash, custom cabinetry and granite counter tops give this 1BR Condo a luxury feel. Berber carpet in bedrooms. You will be thrilled by the finish out. Open your front door and enjoy a resort style pool that is perfect for entertaining! This great community is conveniently located directly off of 75! ° Preston Hollow..Behind The Pink Wall! Adorable Condo in the Trees...Located in rarely available Harcourt House Condominiums on Bandera Ave. UNIQUE & private, free-standing 1 bedroom, 1 bath. No one on either side, above or below. The home has an open floor plan & has been completely renovated, including double paned low E windows, blinds, floors, Kitchen Cabinets, Counter tops, Back splash & Stainless Appliances. All new bath with designer touches! Perfect location and size for an office or second home in the Preston Center area. HOA amenities offer a large pool & Patio Grilling area, community laundry room in building. HOA fee includes electricity, water & trash. Offering the best value behind the Pink Wall! ° Beautiful second story unit with large living area and bedroom. Very close to several shopping areas. Rent includes electricity, water, and trash. Quiet, convenient, established community located north of Preston Hollow Village. Beautifully maintained grounds with large trees and gorgeous pool just steps from this unit. Features open living area with wood floors, washer, dryer, and a cute kitchen that includes a refrigerator. Covered patio attached to living room facing the courtyard. Walk-in closets provide an abundance of storage. Assigned parking space. No smokers. Pets are case by case. If a lease offer is accepted for less than 12 months, the price will not be less than $1300 per month. Owner Managed. ° Additional Info: Pets allowed limit 1, unfurnished, W/D connections incl., available now, 0 covered parking space(s), 1 fireplace(s), Dallas ISD. ° Additional Info: Pets allowed, unfurnished, onsite W/D connections, available now, 1 covered parking space(s), Dallas ISD. ° FULLY FURNISHED updated one bedroom unit in gated community with a central location; Hardwood floors in living and dining area. Travertine floors in kitchen and bath; Kitchen includes granite counter tops, stainless appliances and is fully equpped with dishes and cookware; Master bedroom has queen size bed, walk in closet. Covered patio with pool view. Electricity and water included in rent; Very nice unit. FURNISHED ONLY-NO PETS. ° Additional Info: No pets allowed, furnished, W/D connections incl., available now, 1 covered parking space(s), Dallas ISD. ° Additional Info: Pets allowed, unfurnished, W/D connections incl., available 5/1, 1 covered parking space(s), 1 fireplace(s), Dallas ISD. ° This renovated ground-floor unit has a wall of windows looking to a private patio and the rear gardens of the Preston Tower Garden Building. Living areas and bedroom have faux-wood floors illuminated with abundant can lights. Open kitchen has faux granite counter tops and Frigidaire appliances. Bedroom has two closets, one 6x4, and the bath comes with a granite-topped vanity with tub-shower. No washer-dryer but see large basement laundry room. For your morning swim, you will be only steps away from the Preston Tower pool. Rent includes electricity, water, and high-speed internet with UVerse. Building amenities, including fire pit, fitness center, dog park, tennis-pickle ball court, community room, and library. ° Freshly Renovated in 2018 and Nestled on the edge of University Park and Park Cities, The Caruth embodies distinction and stands as a statement of one's success and reward. The spacious townhome includes a direct access garage and offers a rich blend of luxury features including granite countertops, wood flooring and remarkable views. The luxury community offers a unique blend of amenities that include a car detailing spa, outdoor spaces for entertaining, private patios and balconies and an unbeatable location with direct access to Central Expressway and Northwest Hwy. 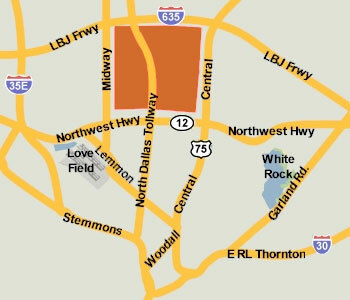 Relish in the fact that you're only steps away from Northpark Mall and The Shops at Park Lane. Experience a new level of luxury at The Caruth. ° Completely renovated 2 bedroom 1 bath unit with new kitchen and stainless steel appliances. Bathroom was also refreshed with new fixtures, bathtub, tile and vanity. Also unit has all new windows and exterior doors to help with your electric bills! Located in the master closet is a washer and dryer stackable unit that comes included and also one reserved parking spot is also included with the unit as well. Please include $35 application fee for each and all applicants. ° Additional Info: No pets allowed, unfurnished, W/D connections incl., 0 covered parking space(s), Dallas ISD. ° NOW AVAILABLE. Spacious, clean and well appointed 2 bedroom, 2 full bath condo in desirable North Dallas locale. Tucked away from Royal Lane to the back of attractive condominium grounds, this end unit has a rear balcony overlooking a tranquil stream. Landlord pays for the electric, water, sewer and trash. LOVE LIVING HERE. ° Newly renovated upstairs condo unit with easy access to Central Expressway makes getting anywhere a breeze. Granite countertops with some new appliances included. All utilities are included with the rent with the exception of cable or internet. Spacious two bedroom unit with two baths and covered parking will make coming home a wonderful experience. Community pool will go well appreciated in the summer. Come dive in. ° Additional Info: No pets allowed, unfurnished, no W/D connections, available now, 1 covered parking space(s), Dallas ISD. ° Desirable, updated, North Dallas Condo. Upstairs unit with all utilities included. Washer, dryer and fridge included. With or without furniture! Kitchen has double ovens, lots of counter and storage space, pretty glass tile backsplash. 2nd living has a dry bar, Oversized bedrooms with TONS OF CLOSET SPACE. Master opens to another balcony that overlooks the pool. Equipped with full size stackable washer and dryer. What a location! Close to medical facilities, DART station, shopping, restaurants, downtown and Northaven walking and bike trails. Don't miss out! $20 monthly HVAC filter program required. See Flyer in Supplements. ° Beautiful and newly (2018) fully furnished contemporary and super comfy apartment in one of Dallas best locations. Living room features 50 inches TV with cable and Netflix, as well as a private work out corner with weights, balance ball, yoga mat and jump rope. Comfortable Queen and king size beds with extra mattress pad for superior comfort and high thread count clean and crisp bed sheets, down feather and down alternative pillow at various degrees of firmness as well as down comforter. Lush cotton towels in bathrooms. Fully equipped kitchen with everything you need for cooking and dining as well as Nespresso machine and milk throffer for your morning Cappuccino. 1st floor unit. Washer and dryer in unit. ° This beautiful sun-filled, spacious and updated condo features 3 sets of French doors to the balcony overlooking pool, a fireplace in living room, rich wood floors and more! The master bedroom has an ensuite bath. The second bedroom can dual as an office and connects to hall bathroom. The laundry room is tucked away in a huge oversized closet. It's as charming as they come and the flow is wonderful! ° Additional Info: Pets allowed limit 1, unfurnished, W/D connections incl., available 5/7, 1 covered parking space(s), 1 fireplace(s), Dallas ISD. ° Listing Agent: Laurie Welch, Allie Beth Allman & Assoc. ° This second story condo has been updated with fresh paint, granite counter tops, kitchen range, dual sink in master and many other must-haves. The spacious floor plan makes it perfect for any tenants â€“ including roommates! The kitchen has an eat-in breakfast bar and has direct access to the covered parking below. The 1,528 square foot condo offers amazing storage â€“ 3 closets in the master, two in the living room and a full size in the second bedroom. The property comes with a washer, dryer and refrigerator. The owner also pays all utilities (trash, water, electricity). There are two assigned carport spaces, a beautiful pool and well-maintained grounds. ° **ALL BILLS PAID & FULLY FURNISHED** This fabulously updated 2 bed 2 bath condo has a fresh modern look with open living & dining areas. Fully remodeled kitchen with modern soft close cabinets, calico quartz countertops, SS appliances and area for a breakfast nook or desk. Beautiful hardwood floors throughout, fully updated guest bath. Designer lighting, Built-in speakers in master bedroom and living room which includes a mounted TV. Also included are full size W-D. Gated parking with covered space and community pool. Great location close to Trader Joes, North Park Center and HWY 75. ° Additional Info: Pets allowed limit 2, furnished, 2 covered parking space(s), Dallas ISD. ° THIS SPACIOUS THREE BEDROOM, THREE BATH HI RISE CONDO HAS TWO PARKING SPACES AND A BEAUTIFUL DOWNTOWN VIEW. THE REMODELED KITCHEN HAS A NEW REFRIGERATOR AND EXTRA PANTRY SPACE. THE LIVING AND DINING ROOM HAVE PORCELAIN WOOD FLOORS. THE BATHS ARE UPDATED. THE MASTER HAS ENLARGED CLOSETS. THE SPACIOUS BALCONIES OFF THE LIVING ROOM AND MASTER ARE TILED. PRESTON TOWER OFFERS 24 HOUR LIMITED ACCESS,COMMUNITY ROOM WITH FULL KITCHEN, LIBRARY, POOL AND FIRE PIT, TENNIS COURT AND EXERCISE ROOM. ALL UTILITIES PAID INCLUDING BASIC CABLE. ° Additional Info: No pets allowed, unfurnished, W/D connections incl., available now, 2 covered parking space(s), Dallas ISD.